​To exploit the technical and economical advantages of calcium carbonate over lime, but improve on the issues of reactivity, Omya has developed a number of advanced remineralization processes that utilize micronized calcium carbonate at their core. These processes achieve reduced contact times, improved CO2 efficiency, or reduce plant footprint and provide for simplifi ed storage and dosing systems. Modular, flexible but robust process design and operation allows adapting to changing operating conditions and consequently provide for stable and reliable remineralization of desalinated water. Omya Advanced Remineralization Processes (OARP) involve the generation of a concentrated calcium bicarbonate solution within a side stream, which can be used to dose into final water stream to increase the hardness and alkalinity content of the final water. 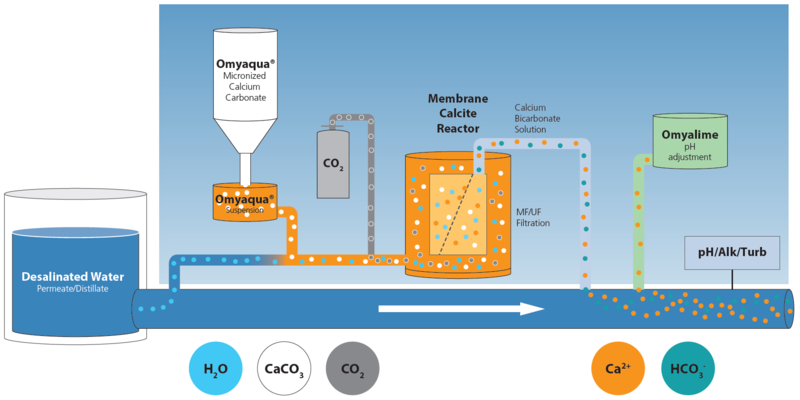 The concentration of the initial Omyaqua® micronized calcium carbonate suspension, the acid dosage and the contact time can all be controlled to obtain the desired concentration and qualities of the calcium bi-carbonate solution before blending with the main product water flow to achieve the final (drinking) water specification. Furthermore, the OARP process allows to follow different permeate flow patterns and therefore provides for an optimized remineralization process at changing plant-operating conditions. Omya has also developed a range of products specifically for use within remineralization of desalinated or mineralization of soft water. Omyaqua® is a micronized calcium carbonate product with unique physical characteristics, including specific surface area and particle size distribution to obtain the best dissolution properties. Omyaqua® has a high purity of over 98%, an insoluble content as little as 0.1% and follows the international Standards for drinking water treatment products EN-1018 and NSF-60. Omyalime® is a lime milk suspension with a purity of in excess of 99% it provides for pristine final water quality and fast reactivity ensuring complete dissolution of the product in under four seconds. In the OARP process these properties makes Omyalime® perfect for direct dosing into the final remineralized water stream for pH adjustment respectively neutralization of excess carbon dioxide thereby increasing the calcium and bi-carbonate concentration of the final water further resulting in lower operational costs and smaller OARP plants sizes.